With the advent of HTML5, webmasters and content creators are scrambling to convert their web pages and applications to the new HTML5 video from older formats like mp4. That isn’t always easy. Because HTML5 video needs to play on a variety of browsers, from the modern versions to iPhones and Android devices to older browsers that haven’t been updated, you need many different versions of your video to work with all possible users. 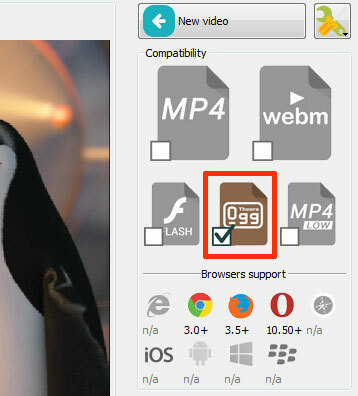 One of the most common is the .ogg extension, which is used by Firefox and Chrome to play HTML5 videos. Converting .mp4 to .ogg has never been easier. To convert .mp4 to .ogg, you will need a conversion program. The easiest to use is Easy HTML5 Video for Mac and Windows (http://easyhtml5video.com). Once the Easy HTML5 Video program is downloaded and running, convert .mp4 to .ogg with these easy steps. Step 1. Drag the .mp4 video that you want to convert into the program. Step 2. Select the file extensions you will convert your .mp4 to (.ogg is listed along with other common extensions for HTML5 video). Step 3.Decide if you would like to resize your video and what method you will use (letterbox for black filler lines or keep ratio for no black lines). Step 4. Select if you want your new .ogg video to autoplay and if you want a watermark. Step 5. Publish your new .ogg video to your computer.